One lucky winner cast out their line in last week’s Google Play Giveaway and reeled in a $35 gift certificate care of Big Fish Games! 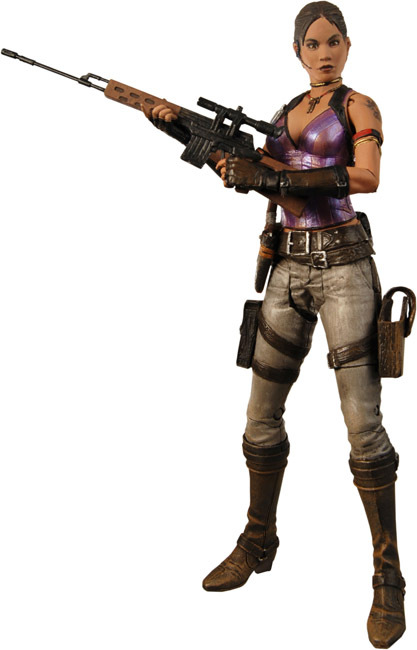 This week we’re shifting gears and giving away two action figures from the Resident Evil series. Continue on to learn how you can enter! Sheva Alomar lost her parents in an accident at an Umbrella factory when she was very young. Later she discovered that her parents’ deaths were the result of biological experiments. Sheva moved to the US and joined B.S.A.A, where she was trained for combat. Now she ventures in the deepest regions of Africa to uncover the mystery around Umbrella and the most recent outbreaks. This 7″ scale figure comes with pistol and rifle accessories and features 20 points of articulation. This incredibly detailed action figure was released in honor of the 10th Anniversary of Capcom’s Resident Evil video game! The Crimson Head Zombie is created using the V-ACT process. It moves quickly and jumps at its victims. It can be identified by its long, sharp claws and red-colored body. 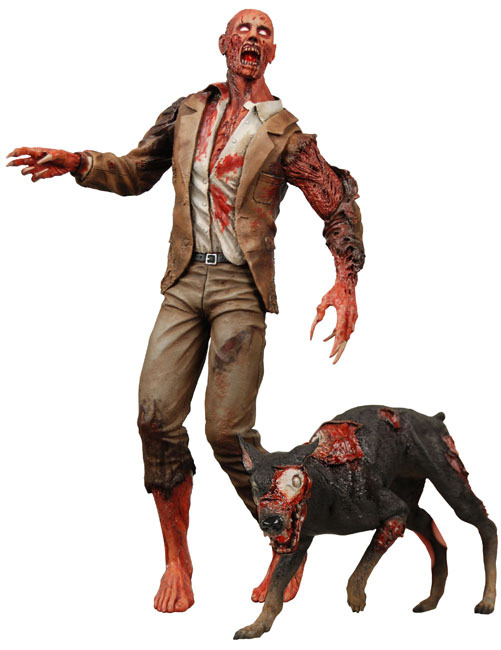 This 7″ scale figure is fully articulated and comes with a truly horrifying canine companion and a display base. In order to enter the contest, you must first answer the trivia question correctly. You can gain more entries with Facebook and Twitter! Always be sure to let us know what you would like to see in future giveaways. We love to hear your feedback and it is very likely that you could see it be the prize next week! 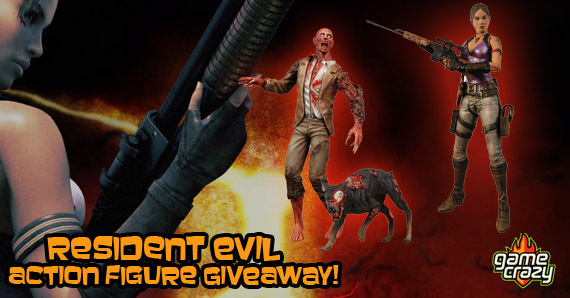 Resident Evil 4 Action Figure Giveaway – Ada Wong and Verdugo! 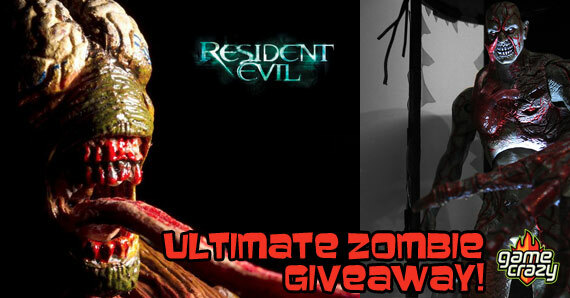 Resident Evil 4 Action Figure Giveaway – 7″ Leon & Chainsaw Ganado Rare Resident Evil Action Figure Giveaway – Executioner Majini Japanese Edition! Ultimate Resident Evil Giveaway: Win the entire 10th Anniversary Action Figure Set! 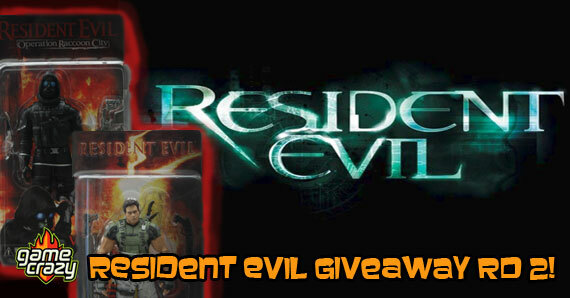 Resident Evil Giveaway #2 – Chris Redfield and Vector Action Figures Rare Gears of War 2 Action Figure Giveaway! Borderlands Giveaway – Jakobs Claptrap Deluxe Action Figure! Bioshock 2 Rare Action Figure 2-Pack Giveaway! This entry was posted in Contests & Giveaways, The GC Blog and tagged action figures, resident evil figures, resident evil giveaway by gcadmin. Bookmark the permalink.